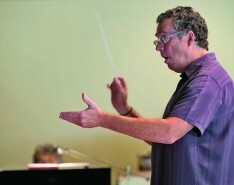 “The Camerata Singers are people with wide open hearts, who want to make the best experience they can for the listeners,” says John Koza, conductor of the Camerata Singers since 1999. And he’s doing what he loves to do. He has four part-time jobs which together make his career. All of them involve music — teaching at Hartnell College, music director for the First Presbyterian Church of Monterey, conducting the Carmel Bach Festival Youth Chorus, and, of course, the Camerata Singers of Monterey. This is his 14th Christmas with the Camerata singers. He earned his bachelor’s degree in vocal performance and his master’s degree in choral conducting at San Jose State University, and sang with the Camerata Singers before being chosen to replace founder Vahé Aslamian as conductor in 1999. Koza’s position requires him to not only conduct the choir, but also to audition the singers and eventually the music they will perform. He then will do what is called a score study with the pieces selected. He anticipates his singers’ questions and needs around the piece (such as, “Where do we breathe?”) and marks up the music before rehearsals even begin. When he organizes a program, there is a theme. This year he is bringing back two pieces that the group has performed before “Because they dovetailed perfectly” into the program, he said. The Camerata Singers have been rehearsing this year’s Christmas program since September. Often the performances are a capella, but this year the John Rutter “Gloria,” the centerpiece of the program, calls for brass, pipe organ, and percussion. “We’ve hired the best available,” he said. The accompanists have been rehearsing separately, and will have two rehearsals with the singers. One of the pieces is the hardest piece he has ever attempted, says Koza, because of changes in meter. “When Christmas is over, I can relax,” he says. But not for long. In January, the Camerata Futures program begins a nine-week rehearsal program. High school-aged singers rehearse weekly including a full day rehearsal in February concluding with a performance with the larger group in March. There will also be a fund-raising performance in May. Camerata Singers will perform their current program three times this weekend: Fri., Dec. 13 at 7:30 p.m. at St. Paul’s Episcopal Church in Salinas; Sat., Dec, 14 at 7:30 p.m. at the Carmel Mission in Carmel; and Sun., Dec. 15 at 3:00 p.m. at First United Methodist Church in Pacific Grove. Tickets are available at Bookmark in Pacific Grove, Pilgrims Way in Carmel, Wild Bird Haven in Del Monte Center in Monterey, and Zeph’s 1-Stop on Main Street in Salinas. For more information or to order tickets online, see www.camerata-singers.org.